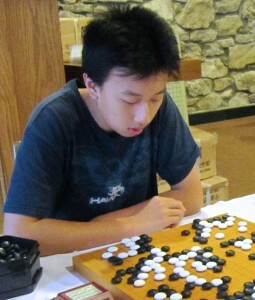 Calvin Sun 1P has been selected as the new American Go Honor Society (AGHS) President. “I’m really glad to be the President for AGHS this year,” Sun told the Journal. “This has always been a goal for me because I feel like go has lost much of its popularity in the past couple of years in the United States, especially among kids. I wish to bring back the enthusiasm that children had for go when I first started the game. I am very excited for another year of hard work and fun.” The AGHS runs the popular School Teams Tourney, the Young Lions, and other youth events as well. Outgoing Co-President Andrew Huang 6d issued a call to ” all young go players and enthusiasts who are interested in becoming leaders in promoting and teaching go across the country. I encourage you to apply for an officer position. We will be led by Calvin Sun next year, but we still have openings for vice president, tournament organizer, treasurer, secretary, promotion head, and webmaster. We recommend that you only apply if you will be in high school next year. The application form can be found here. This is a great opportunity for you to serve the go community, and we look forward to reading your application.” -Story and photo by Paul Barchilon, E-J Youth Editor. Photo: Calvin Sun 1P looks into the future. Last of a series of profiles of players in the 35th World Amateur Go Championships, which will be held July 4-11 in Gyeongju, Korea. Fifty-seven players from a like number of countries and territories are scheduled to make the trip to Korea to compete in the four-day, eight-round Swiss system. Many will be veterans of previous tournaments held in Japan and China, some drawn back to WAGC competition after a long absence, perhaps by the chance to be part of the first WAGC held in Korea. As usual, the largest contingent will come from Europe (30 players) and the youngest from the Far East (15 players, including an 11-year-old fromIndonesia). Click here for Ranka’s June 24 WAGC preview. Canada: Yongfei Ge 7D is a 45-year-old software architect from Scarborough. He’s been playing for 30 years, winning the Canada Open Championship in 2007, and the US Open Championship in 2001, 2007 and 2011. His favorite thing about go is to “Win after hard fight.” Hobbies include PC games, novels and running. Career highlights include the Horizontal Award, “signed by Paul Allen, co-founder of Microsoft.” He’s married, with one daughter. Costa Rica: Enrique Boza Araya 7k is a 52-year-old systems engineer in San Jose. He’s been playing go for 11 years and says his favorite thing about the game is “The depth of the game despite its simple rules.” His hobbies include strategy games – he’s a 5-time champion at the Banco Central de Costa Rica’s annual tournament — writing fantasy stories, and movies. Mexico: Ricardo Quintero Zazueta 5D is a 63-year-old mathematician and full time researcher at Cinvestav in México City. He’s been playing go for more than 40 years and has been Mexican champion eight times. His favorite thing about go is “Making lasting friendships through go and the depth of the game itself.” His hobbies include Kendo. He’s married, with three children. Missing: Brazil (probably too busy with the World Cup!). Australia: Sang-Dae Hahn 7D is a retired professor who just turned 73 and lives in Sydney. He’s been playing go for 48 years, and is a 12-time Australian Champion (1978~1993) and won the 2012 Korean Ambassador’s Cup. His favorite thing about go is “creating my own aesthetic world” and his hobbies include “singing, traveling, and people.” Career highlights include teaching at Yon-sei Uni, Sydney Uni, Myongji Uni and 10 times Singing Recital. He’s married, with one child. Go Quiz: Three Firsts; Who’s Second? Last week’s Quiz was inspired by EJ reader Vernon Leighton who thought he spotted an error in a May 13 Wired article on go. “It said that Michael Redmond (far right) was the first American go professional and that James Kerwin (near right) was the second. I believe that Kerwin was the first.” As the vast majority of respondents knew, Kerwin was indeed the first American pro, but the real answer is a bit more nuanced. The Wired article correctly said that “The charismatic Redmond, an American… remains the only Westerner to ever reach 9-dan, the game’s highest rank” and that “James Kerwin…(became) the second-ever Western professional Go player” which is what created the confusion. 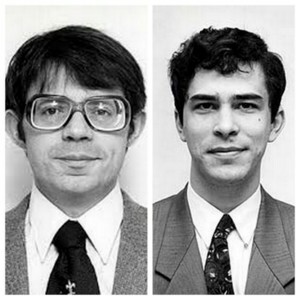 Manfred Wimmer 2P (left) of Austria was the first Westerner to achieve professional status in 1978 at the Kansai Kiin; Kerwin 1P, from the United States, became a professional later that year at the Nihon Ki-in, the first westerner to do so there. Redmond was the first Western professional to achieve the rank of 9P, in 2000. Michael Goerss of Scottsdale, AZ is this week’s winner, chosen at random from those answering correctly. This Week’s Quiz: Most of the registrants for the upcoming US Go Congress are from the United States; which country has the second-highest number of registrants? Click here to submit your answer. AVE-KONTAKT s.r.o., PromoGo o.s., and the Czech Go Association will host the 13th International Czech Open on July 11 through July 13. Cash prizes will be awarded to the top five players, the top five EGF players, and players with five and six points. Additionally, material prizes (3000 CZK value) will be awarded to those with four points, the best female player, and the best youth players who accumulate at least three points. Starting fee is determined by rank, with the maximum fee as 17 EU. For more information including a full schedule and accommodations, please visit the official Czech Open 2014 website. Love the Czech Republic? Coming this fall: the 2014 annual international tournament BRNO. An official video trailer (preview below) is currently being featured by our friends at EuroGoTV. Capital One has informed its Card Lab Connect partners that it is ending the program, under which AGA members could apply for go- decorated VISA cards whose fees were shared with AGA, according to AGA President Andy Okun. “I am quite disappointed, as the program was a nice addition to the AGA budget and the cards a nice conversation piece,” he told the E-Journal. New applications are no longer being accepted, although spending on existing cards will generate revenue through the end of September. 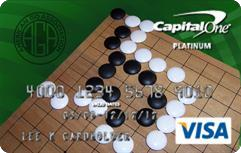 After that the cards will be replaced with ordinary Capital One cards, which members may keep or cancel as they please. The AGA will make good on its offer of a $50 cash rebate for New York Congress attendees showing the card. “We promised,” Okun said (U.S. Go Congress Registration Opens with Special Rebate Offer 3/30/2014). Capital One cited declining business in the wake of the 2008 financial crisis as reason for leaving the affinity card business. There are a few similar other programs out there, but Okun said he would like feedback at president@usgo.org before deciding on whether to go down that path. United King dom: The Welsh Open finished in Barmouth on June 22 with Alistair Wall 2d in first, Toby Manning 2d in second, and Christian Scarff 1d in third. Bosnia and Herzegovina: Also on June 22, Mijodrag Stankovic 5d dominated the 10th Open Zelenkovac. Mihailo Jacimovic 1d came in second and Daniel Zrno 2k in third. 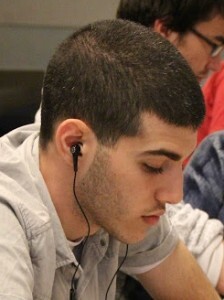 Austria: Ali Jabarin 6d (left) took the Wien 2014 Vienna International Tournament on June 22 while Cristian Pop 7d took second and Hui Fan 8d placed third. If you’re in the St Louis area this weekend – or maybe just passing through the airport – you’ll want to stop by the stamp show at the Renaissance St. Louis Airport Hotel. 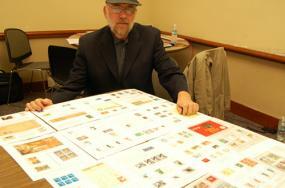 Longtime go player and philatelist Les Lanphear will be showing his award-winning stamp exhibition “Go, The World’s Oldest Board Game,” which uses brilliantly-colored stamps from around the world to tell the story of go, from its’ origins through development of the game, the people involved, as well as various related historical developments, including go’s transmission to Japan, Europe and the United States. “The last time I showed the exhibit was around three years ago,” Lanphear tells the E-Journal. “About 50% has been changed with many new items. I am getting it ready for an international exhibit on Korea in August.” The hours of the show are 10a to 6p Friday and Saturday and 10a to 4p Sunday. photo: Lanphear at the 2008 US Go Congress in Portland, OR; photo by Chris Garlock. Third in a series of profiles of players in the 35th World Amateur Go Championships, which will be held July 4-11 in Gyeongju, Korea. Germany: Bernd Radmacher 4D (left), 42, lives in Meerbusch (near Düsseldorf, Cologne) where he’s “just looking after my children at the moment.” He’s been playing go for 25 years, placing second in the 2013 German Championship, and played in the 2008 WMSG amateur tournament in Beijing. He likes go’s “creativity and beauty, creating shapes on the board” and the game’s “magic, even for pros, who study it all their lives. It has surprises in every game.” Hobbies include other board games, and playing piano. Married, he has one daughter (18), and two sons (16, now 2-dan, and 13). Norway: Oeystein Vestgaarden 2D (right) is a 35-year-old project manager for digital learning software in Oslo. He won the Oslo Open in 2012 and 2013 and was the Norwegian participant in the 28th WAGC in 2007 and the 31st WAGC in 2010. He’s been playing since he was 19 and likes “The simplicity of the rules combined with being infinitely difficult to master. 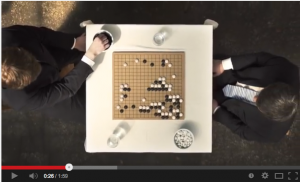 Go has a certain beauty that no other board games can match. On the more practical side, I like that the game is equally enjoyable in both silent ‘study-like’ environments and more relaxed environments like a café or pub.” For hobbies, “I sing in a choir, play the bass in a band, play football, indoor climbing, reading, mountain hiking.” Other accomplishments include working as an editor in a publishing company for seven years. Poland: Stanisław Frejlak 4D (left) is an 18-year-old student in Warsaw. He’s been playing since the age of 6 and was Polish Youth Go Champion Under 16 in 2006, 2007, 2008, 2009, and 2011, Under 18 champion in 2010 and Polish Go Champion in 2012. “My favorite thing in go is the exciting fights between big groups on which a game’s result depends.” Hobbies include maths and he was Laureate of Polish Mathematical Olympiad (2013, 2014) and took 3rd place with the Polish Team on “The Baltic Way mathematical contest” (2013). Romania: Lucian Corlan 5D (right) says go is “A many-splendored thing.” His hobbies include reading, basketball and tennis. The 34-year-old software engineer hails from Bucuresti. Serbia: Nikola Mitic 6D (left) is a 22-year-old student from Nis. He won the 2013 Serbian Championship and the 2014 Serbian Cup. He started playing at the age of 6 and likes “Fighting on the board, meeting people off the board.” Hobbies include reading, basketball, football, and video games. Slovakia: Peter Jadron 4D (right) is a 33-year-old psychiatrist who currently lives in Karlstadt, Germany. He’s been playing for about 20 years and was the Slovakian Champion in 2008. “I like the fact, that only a well balanced combination of intuition, creativity, flexibility, knowledge and deep reading leads to success in the game of go,” he says. He’s married and has two children. Hobbies include cycling, nature, photography, classical music, composing and medicine. Slovenia: Timotej Suc 3D (left) is a 30-year-old EM physician in Ljubljana. “I like complex battles,” he says, adding that “Because of go I have traveled many places in Europe and also elsewhere.” He’s been playing for 15 years and achievements include 1st place in the 50th Ljubljana Open in 2011, Slovenian team champion with the Ljubljana Go club from 2005-2013, Balkan student champion in 2007, 1st place in the 2005 Rijeka Open, 2nd place in the Slovenian championship in 2008 and 2012, and 3rd place in the Slovenian championship in 2010,’11 and ’13. He’s married and has three children (5y, 3y, 6m) and his hobbies include playing football. United Kingdom (England): Francis Roads 1D (though he notes “formerly 4 dan”) is a Retired Music Education Advisor who lives in London. Roads (left) learned to play at 22, has been playing for 49 years and his titles are “Too many to count.” His favorite thing about go is “The people that you meet.” Hobbies include West Gallery Church Music and he currently serves as Honorary Secretary of the West Gallery Music Association, and Music Director of London Gallery Quire. He retired as Head of Music Curriculum Support for Essex County Council. “My selection as British representative to the 2014 WAGC results from the points system in our Challengers League, which rewards persistence as well as competence,” he notes. Missing (we hope to include in a future edition): Azerbaijan, Denmark, Portugal, Russia, Sweden. 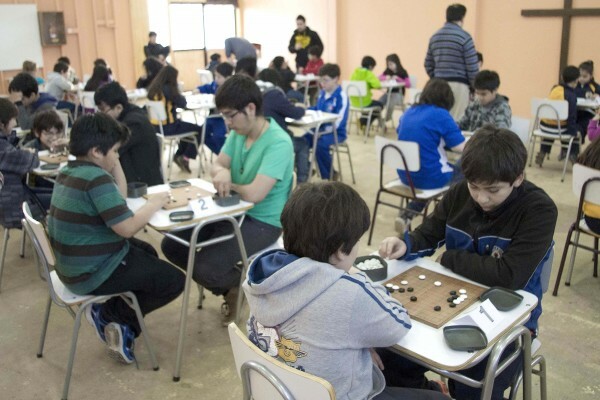 “Forty children between the ages of five and sixteen competed at the first inter-school go tournament, in Punta Arenas, Chile, on Saturday June 6th,” reports organizer Sebastian Montiel. “Three categories were played depending on the experience of the participants: 13×13, 9×9 and Atari-Go.” The tourney was held at Colegio Luterano, with five schools competing, and was organized by the Aonken Go Club. First place winner in the 13×13, Matias Salinas, age 13, writes “I would like Punta Arenas to become world famous in the world of go, and for people from other countries to travel to this city just to play go.” Aonken Go Club, which joined the Chilean Go Federation as an official club in 2013, has been promoting Go in Punta Arenas vigorously. Aonken, another name for the indigenous language of Tehuelche, means south. “This name represents our geographical location in the world and pays tribute to the original people of our land,” according to the Aonken Go Club Website, which can be seen here, or translated into English, here. Winner’s Report: 13×13 Category: First place: Matías Salinas, Colegio Luterano; Second place: Elian Velasquez, Colegio Luterano; Third place: Benjamin Mimiza, Colegio Luterano; Fighting Spirit: Manuel Acuña, Colegio Luterano. 9×9 Category: First place: Anastasia Sanhueza, Escuela J. Williams; Second place: Maria Trinidad Villanueva, Colegio Luterano; Third place: Joaquín Oyarzo, Contardi; Fighting Spirit: Bastían Zuñiga, Colegio Luterano. Atari-Go Category: First place: Francisco Jerez, Colegio Luterano; Second place: Benjamin Leiva, Escuela Juan Williams; Third place: Belen, Escuela Juan Williams; Fighting Spirit: Tiare Santana, Colegio Luterano. -Paul Barchilon, E-J Youth Editor. Photo by Jose Fernandez. Excellent catch! Our apologies for the mix-up; Ohlenbusch is indeed the Danish rep (he lives in Germany, which was what confused us). We’ve corrected the original report and included German rep Bernd Radmacher in today’s player profile preview.